I love to use multi tier elevation effects on locations. 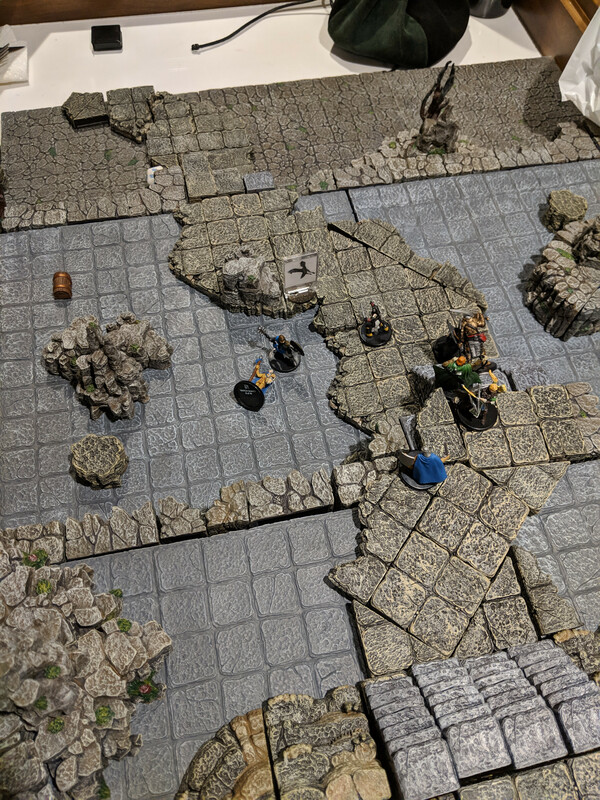 That is when the real power of actual terrain vs marking stuff on a mat comes into play. Makes lines of sight so much easier to determine and helps to give the players a better vision of the setting. I bought the rules this week, am lining up appropriate minis, and am looking forward to the solo option between my regular game group. Well done with the DF layouts. Wow, that looks like a whole lot of fun! Two more scenarios were successfully completed last night. In Mission 2, Scenario 3: Tor Varden, the Upper Level, the top of the tower is surrounded by a rickety wooden platform. A captured soldier is chained to a pile of wood and the nearby Shadow Knight threatens to set it alight. We got lucky with a very solid first shot on the Shadow Knight, so he turned out to be no threat. One of the gnoll archers also got knocked off the platform to our great amusement. 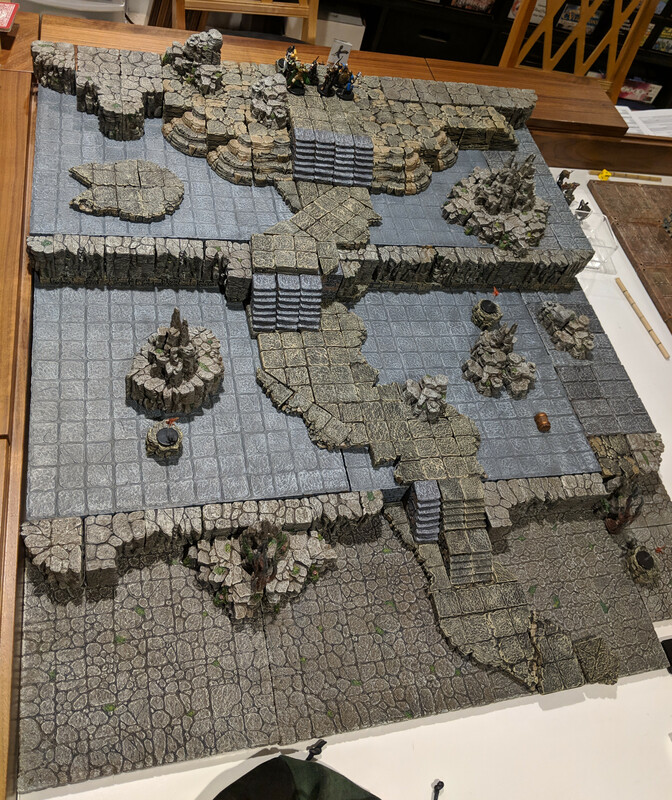 In Mission 3, Scenario 1: Descent into Darkness, the Broken Stairs, our rangers set out to descend a 60 degree slope (use your imagination, I don't have enough elevation platforms to build a slope that steep) on a crumbling stairway. On the way down, we were assaulted by some giant flies, but they proved to be only a minor annoyance (no one took any damage from them). Here, Edmund, Duke of Edinburgh goes off-piste to investigate a corpse and finds the deceased soldier's undelivered love letter. and plenty of room - a problem many builds that look nice don't solve. 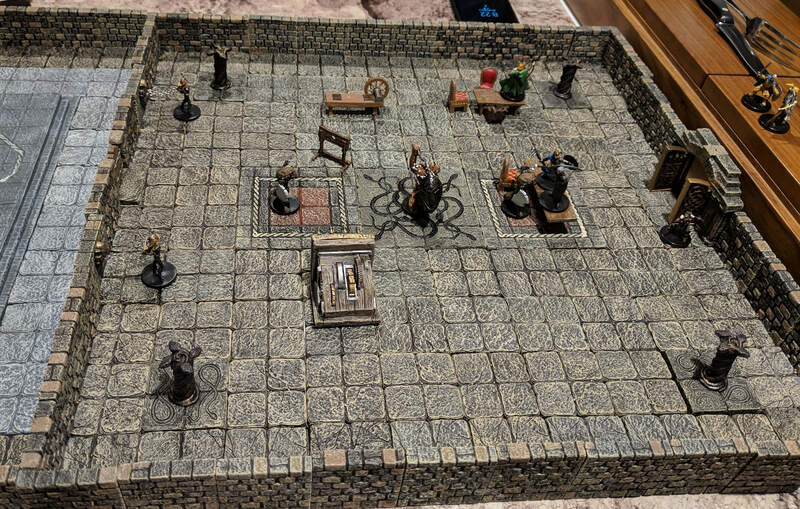 We played the first two scenarios of Mission 2 (the Beacon Tower) last night. 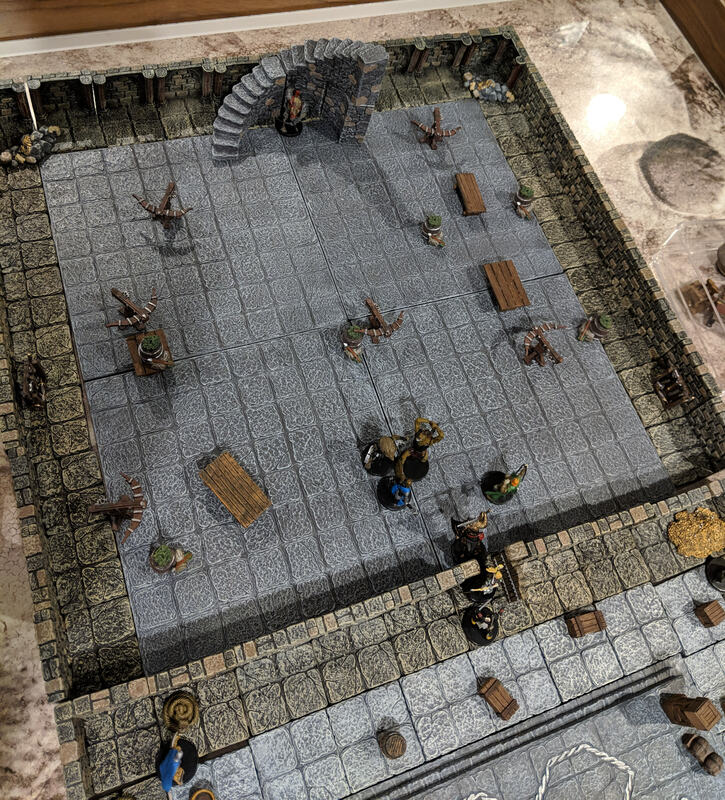 Scenario 2 (Tor Varden Lower Level) is a series of three large rooms. 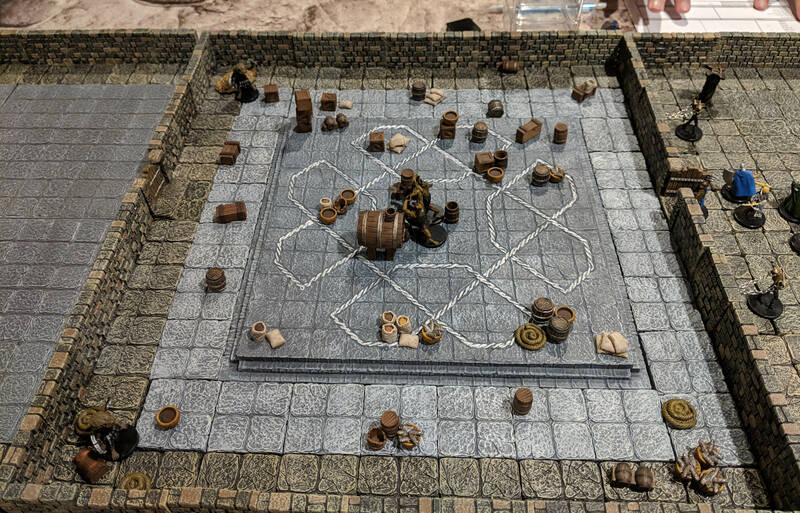 This setup exceeded my supply of dungeon floors, so I had to get a little creative with the flooring. The contents of each room are determined randomly when the rangers enter, so we just tossed in appropriate furnishings without much planning. The first room was the torture chamber. We will rescue the prisoners chained to the wall at the end of the mission (assuming we survive Scenario 3). We also found a hidden note informing us that a shadow knight is now in control of the tower (we'll fight him atop the tower in Scenario 3). The second room was the storage room. Not that interesting, except for the treasure in the corners. 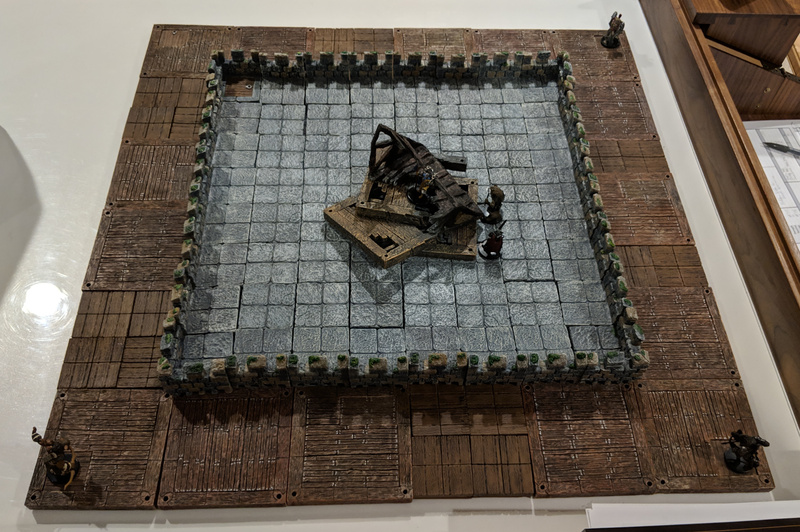 The final room, with the stairs leading to the top of the tower and the final scenario, was the armory. Fortunately, the gnolls didn't know how to use those ballistae! One of our rangers (Edmund, Duke of Edinburgh) fell to the gnolls in this room, but survived. He'll start the third scenario wounded, though, which might make it a challenge. The whole third scenario in one shot is below. 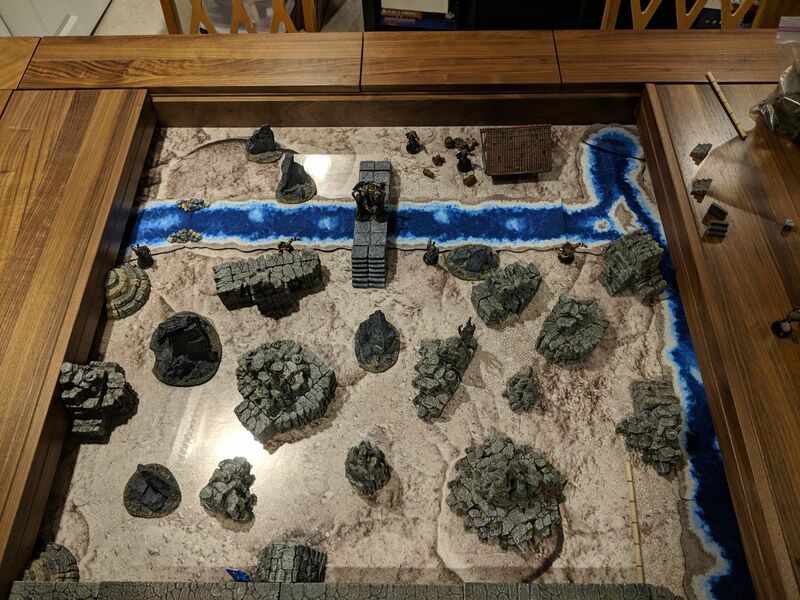 Takes up a lot of table space! I've played the first two scenarios in a group of three and the first three scenarios solo. Great fun, plays fast, not at all fiddly. I think it's more fun with a group, but it's okay solo as well.